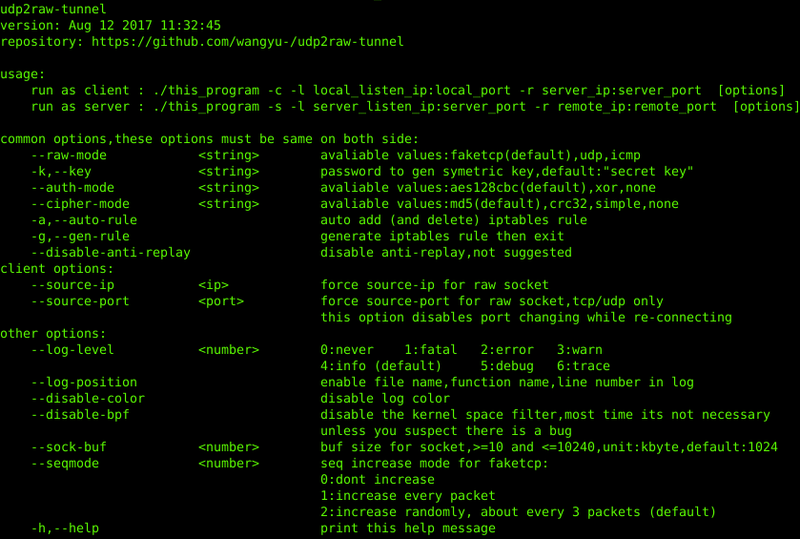 Browse: Home / udp2raw-tunnel ~ An Encrpyted, Anti-Replay, Multiplexed UDP Tunnel for Bypass UDP Block or QoS. udp2raw-tunnel is An Encrpyted,Anti-Replay,Multiplexed UDP Tunnel which can help you Bypass UDP Block or QoS by tunneling UDP traffic through Fake-TCP or ICMP by using raw socket.It aslo acts as a Connection Stablizer. Fake-tcp/icmp headers help you bypass UDP blocking, UDP QOS or improper UDP NAT behavior on some ISPs. Raw packets with UDP headers are also supported.In UDP header mode,it behaves just like a normal UDP tunnel,and you can just make use of the other features. Simulates the 3-way handshake, along with seq and ack_seq. TCP options MSS, sackOk, TS, TS_ack, wscale are also simulated. Real-time delivery guaranteed, no TCP over TCP problem when using OpenVPN. – Encrypt your traffic with AES-128-CBC. – Protect data integrity by MD5 or CRC32. 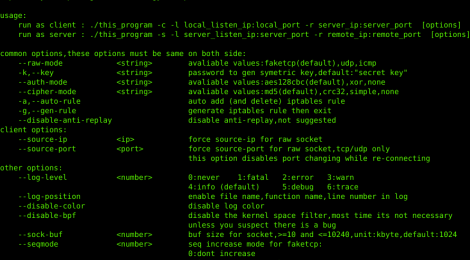 – Defense replay attack with an anti-replay window, smiliar to IPSec and OpenVPN. – Authenticate mutually, no more MITM attacks. Conection failures are detected by heartbeats. If timed-out,client will automatically change port number and reconnect. If reconnection is successful, the previous connection will be recovered, and all existing UDP conversations will stay vaild. For example, if you use UDP2RAW + OpenVPN, OpenVPN won’t lose connection after any reconnect, even if the network cable is re-plugged or the WiFi access point is changed. + Multiplexing One client can handle multiple UDP connections, all of which share the same raw connection. + Multiple Clients One server can have multiple clients. + NAT Support All of the 3 modes work in NAT environments. + OpenVZ Support Tested on BandwagonHost. 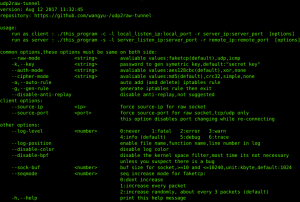 + OpenWRT Support No dependencies, easy to build. Binary for ar71xx are included in release. ← Egression – tools for testing the data loss prevention controls on a corporate network.